At the end of the third quarter of 2018, general government's net financial assets, i.e. the difference between assets and liabilities, amounted to EUR 140.4 billion. Net financial assets went up by EUR 2.3 billion from the previous quarter, driven by employment pension schemes and central government. The net financial assets of employment pension schemes grew in total by EUR 2.3 billion and the net financial assets of central government by EUR 0.5 billion. These data derive from general government financial accounts compiled by Statistics Finland. Central government's net financial assets grew by EUR 0.5 billion from the previous quarter's level, being EUR -60.9 billion at the end of the quarter. Both central government assets and liabilities contracted during the quarter. Assets decreased by EUR 2.2 billion mainly as the stock of long-term loans declined. Liabilities contracted by EUR 2.7 billion particularly due to the fall in the stock of debt securities. A transition from long-term debt securities to short-term debt securities is visible in the stock of debt securities. 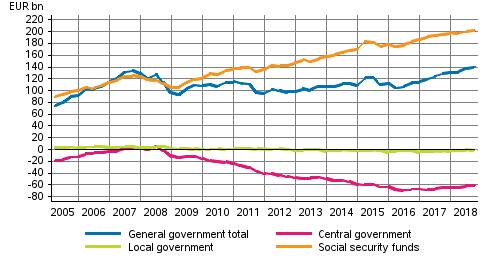 Local government's net financial assets fell by EUR 0.4 billion. Assets contracted by EUR 1.1 billion and at the same time liabilities decreased by EUR 0.8 billion. Assets went down due to the fall in the deposit stock and the other assets item. The fall in the stock of liabilities was caused by the contraction in other liabilities. The stock of long-term loans was EUR 16.4 billion at the end of the quarter. Employment pension schemes' net financial assets stood at EUR 200.0 billion at the end of the quarter. Employment pension schemes received EUR 1.5 billion in holding gains from investments in shares and EUR 0.8 billion from quoted shares. The combined acquisitions of shares and mutual fund shares on net remained at EUR 0.1 billion. The deposit stock grew by EUR 0.9 billion and the stock of debt securities decreased by EUR 0.7 billion. The net financial assets of other social security funds decreased by EUR 0.1 billion and were EUR 2.0 billion at the end of the quarter. The fall in assets was due to the contraction of the deposit stock. ISSN=1798-1964. 3rd quarter 2018. Helsinki: Statistics Finland [referred: 24.4.2019].